So originally wanted to see which Misfits albums use 'whoa', 'oh', and 'go' most often. The problem is that 'whoa' and 'oh' are not really considered part of the main lyrics of the band. So on some albums they are included in the lyrics, but for other albums they are not. This means that I did not have accurate data for how often these words are used on each album. Bummer. However, the words 'love', 'death', and 'hell' are used a ton by the band, so I took a look at those instead. 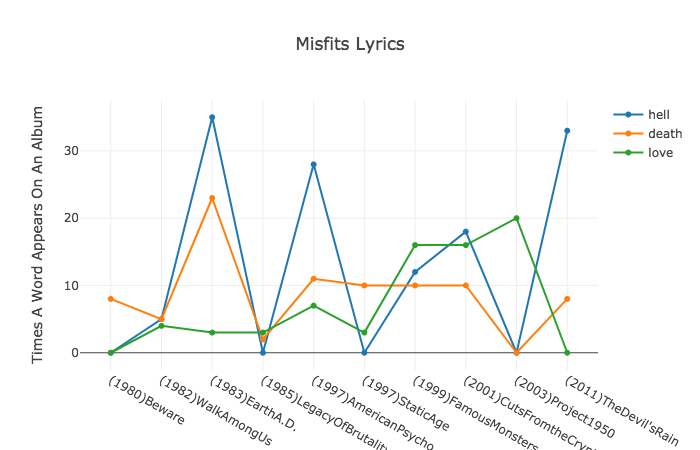 These were not the most common words used, but they were certainly in the top 20 of the most common words used by the Misfits in their songs.